Every music producer you'll meet will have their own particular music production process. You'll however find certain similar processes or stages all producers must go through to create viable tracks. You'll develop your own music production process as you practice your craft. 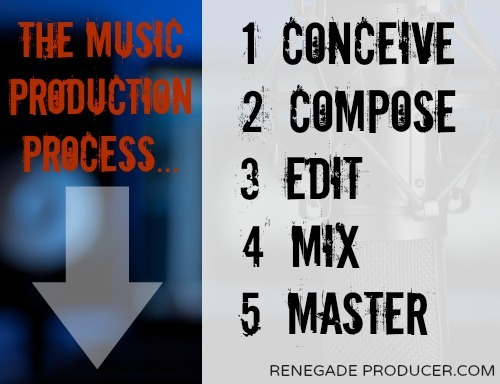 You'll discover the core stages of the basic production process below so you'll have a big picture idea of what you'll be doing when you make your own music. Making music has a creative and technical aspect and each requires a different mind-set from you. 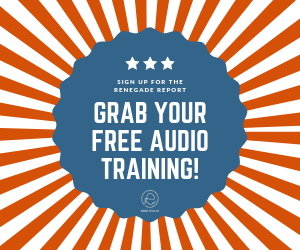 You will in time learn to be able to move between the creative and technical mind-sets with ease as you will need both throughout the music production process. You can divide the process of making your music up in to five basic parts of which you will only do the first four yourself unless you plan on mastering your own music. Let's take a quick look at each aspect of the music production process and then also the basic electronic music production process. You will first come up with a basic idea or theme. You then try as be as clear as possible in your own head as to what you want to create with your song. You want to imagine what it will sound like once you have completed it and which instruments you'll use to create the sound you want. This is when you create and choose your sounds, decide on your theme and create the basic sketch of the production. This can include your main melody, chord progressions, loops and basic beats. This is the stage where you "get it down". Dance music producers will build the track up from samples, loops and MIDI. Music producers who work with bands and musicians will record the different parts of the track at this time. In this part of the production process you create your full track arrangement and finish the musical aspects of the track. You will in this stage drag, drop, cut, trim, copy, paste, quantize and nudge the various programmed or recorded parts to fit together well and produce the completed raw song. This part of the process where you ensure you have no clicks and pops, that all your transitions work well and any unwanted audio or MIDI is removed. You want to also make sure your timing is tight on all parts. Mixing or mixing down is the final stage in which you use levels, EQ, panning and effects to create the stereo image and final sound you want. 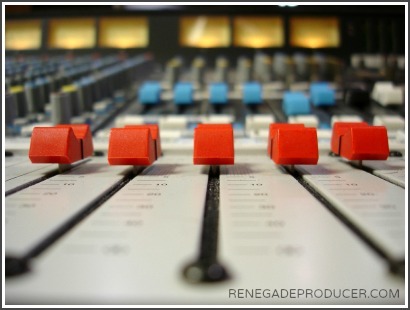 You have a choice to do this yourself or send your session to a professional mixing engineer. A good mastering engineer will take your mix and finalize it into a master ready for public use. They will use various techniques and tools to make sure the track is loud enough, has a good stereo image and sounds professional. Now, it's possible to master at home and this could work fine for mixes you want to play out in a hurry. Professional mastering is however the best choice for commercial releases meant for distribution. Mastering studios will also have professional equipment for mastering which you won't find in normal project or bedroom studios. This is one place where it's best to leave it to those in the know! So, there you have the basic music production process. Remember, nothing is set in stone here! Your actual process will probably look like some chaotic mutant-child of the above process. Some producers, for example will mix as they go along and not have much of a dedicated separate mix-down session because they feel this is important to keep the vibe going. Hey, if it works, keep it! The point of a structured production process or workflow is to help you finish tracks so as long as you accomplish this you're on the right track. Create a 8, 16 or 32 bar loop. This loop should be the climax of your track, usually the last chorus. It needs to be full and banging. Take the loop you've created and copy it over once. Remove elements from the copy of the loop. You could for example remove some of your synth parts like the melody. Then, add new elements to the copied loop to make it different from the first loop. Now, repeat steps 2 to 4 to create a third version of the loop that's different from the first two. Use the 3 loops you have to create your full track arrangement. You can use other popular tracks as references for your arrangement. Do your final edits. Listen to each track and remove unwanted artifacts such as clicks and pops. Remove anything that annoys you and add elements which seem missing. Mix your track: Balance your levels. Check your panning. Check your mono compatibility. Apply your final automation and FX. Reference your track on as many different speakers and systems as you can and take notes. If the track is meant for Clubs then it pays to reference it on a big rig before your final mix. Make your final tweaks to the mix if needed and bounce it down. You are ready to send your track for mastering once you've completed step 10. You will experience a burst of energy when you're inspired with a new musical idea (stage 1) for a track. You should use this energy to drive you through the work you have to do while recording, tracking and editing (stages 2 and 3). You will then be ready to mix (stage 4) which means completion is in sight. This creates a new burst of energy which drives you towards the completion of your track. The final trick is to know when to stop and avoid the dreaded overkill. You want to be clear in your mind about the result you aim for so you know when the track is completed. This makes the music making process so much easier. I hope this post helped to clarify the basic music production process for you!